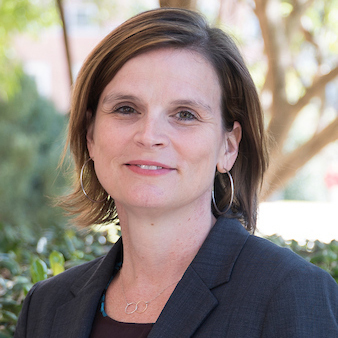 Samford’s Howard College of Arts and Sciences has honored Geography Department chair and college alumna Jennifer Speights-Binet ’94 with its annual teaching award. She was chosen from 11 professors nominated by faculty and students. Fred Shepherd, Political Science Department chair and chair of the college's Teaching Award Committee, announced the honor at a faculty assembly Feb. 6. He noted that Speights-Binet “began her Samford journey as an undergraduate student, and has dedicated her time here to providing Samford students with an unforgettable and enriching classroom experience.” The faculty and students who nominated Speights-Binet described her as dedicated, passionate, versatile, challenging and accessible, and noted that she serves not only in her department but also in the university’s core curriculum, University Fellows honors program and London program. In recent years, Speights-Binet has collaborated in an innovative, interdisciplinary approach to teaching that blends elements of geography, history, sociology and important texts. In 2016, she and English professor Keya Kraft formed one of 15 U.S. teams chosen to take part in the Association for Core Texts and Courses’ Summer Seminar Project at the University of Chicago and Columbia University. Their project– The City as Text: Urban Space in the Literary Imagination–grew out of Speights-Binet’s innovative work in Samford’s Core Texts in London initiative.